When a company makes the move from tolerating mobile in the workplace to embracing it as a key aspect of their overall strategy, there can be some bumps along the way. 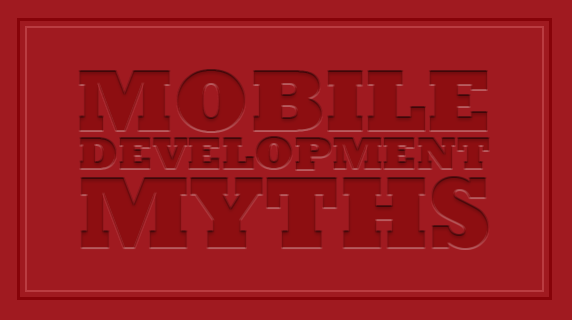 In particular, there are a number of misperceptions that can stymie early-stage mobile development in an enterprise setting. Below, we debunk some of the most prevalent myths that we see. When companies first get started with mobile, it’s common to see the lines of business each doing their own thing, which can create silos and result in redundancy and incompatibilities. Provided the right level of support, successful development projects can certainly take place within the lines of business. Centralizing app development isn’t necessary, and often the best results come from individual departments who are empowered to produce mobile apps that align to their close understanding of real needs. When companies recognize they need a mobile app, they often tackle it the way they would any other one-off project. Big mistake. Building a high-quality mobile app isn’t something you just do once and then you’re done. It requires ongoing care and feeding and dedicated resources to get it right. You have to keep up with the regular operating system updates, new features sets and rapidly shifting user expectations. Mobile apps aren’t projects; they’re products. In other words, they must be iterated on as you collect analytics and feedback, so that they get better over time. And you should expect to put out new releases six to 12 times a year. Not every company has the resources to build mobile apps in-house, so many turn to mobile development firms. If you’re considering this route, recognize and budget for a longer-term partnership. Select a partner who will be committed to not only building the app but using data to refine it over time. A good partner should be able to explain exactly how they plan to harvest app and user data to constantly make your app better. It may be tempting when you start to think about building apps to just build one huge app that packs in tons of key features. Won’t that make life simpler for your users? While the logic here is understandable, it doesn’t hold in the new mobile reality. People expect intuitive, purposeful experiences that simplify their lives, and a mega-app can’t accomplish this. For instance, instead of attempting to replicate the entire employee portal inside a single app, create multiple native apps that are optimized to do just one or two things really well. You may want an expenses app that all employees can access, and your sales team might also want an app specific to their workflow (like ours did). Catering to the unique needs of both separately is better than trying to cram disparate features into one bloated mobile app. Check out our post on why apps are not applications to better understand what a successful mobile app looks like. It’s important to get your mobile apps out the door and in the hands of users quickly. But companies often shortchange the user experience of employee apps, thinking that employees will just use whatever tools they are given. Mobile can open the door to big gains in employee productivity, but a poor experience can easily neutralize the opportunity. Employees today have plenty of apps to choose from, and even if you pre-install yours on company devices, you can’t force usage. Instead, encourage real adoption by elevating user experience to serve as the guiding principle no matter who your app is designed for. Remember whether you’re building for B2C, B2E or B2B, the only acronym that matters in the new mobile world is B2U. Think you can release app updates as frequently (or infrequently) as you’d like? Think again. You may control app release velocity to an extent, but remember that you co-own it with Google, Apple and Microsoft. And they are in a race to outdo one another by unveiling shiny new capabilities multiple times a year — necessitating constant updates on your end. In the “Wintel” days, new versions of enterprise software were only released every couple of years, and companies had full control of when they rolled out a new release. Today, your users will upgrade almost immediately when new OS versions come out. And they expect frequent updates from you so they can take advantage of the latest features. If your release velocity doesn’t match their expectations, they can easily delete your app and download another. So don’t fool yourself into thinking that you have a monopoly on release velocity. Instead, build an organization that can respond to this new mobile reality. Mobile isn’t just another channel that you can bolt onto your existing systems. For one, it requires a whole new tier of architecture. You need to make sure that it’s easy to access data in a size, format and manner that works for mobile. Easy access to data via mobile-optimized APIs makes it possible for developers to create better apps faster by spending less time contending with backend integrations. You also may need to rethink your organization and delivery processes to enable rapid-fire app releases. That may sound like a tall order, but it’s well worth the effort when you realize the benefits of a successful mobile development program, whether the apps you’re building are for employees, customers or anyone else. Check out our new ebook on mobile app development for more details on how to scale your efforts for the new mobile world. There is a persistent myth that there is a tradeoff when building mobile apps – that you must choose either the faster development and lower cost of web apps or the better experience, performance and security of native apps. When it comes to attaining mobile velocity and superb user experience, a cross-platform mobile development and analytics tool like the Appcelerator Platform can help you have your cake and eat it too. Which of these myths have you seen in action in the enterprise? Did we miss any big ones? Mobile application development is the process by which application software is developed for low-power handheld devices, such as personal digital assistants, enterprise digital assistants or mobile phones. Useful and insightful perspective. Apps should promote frugality over abundance. Developers need to focus on bundling relevant functionalities crispy and concisely. However, many apps are becoming one more “access channel” for monolithic back-end applications running in datacenters. Should organizations change their back-end applications as well to make them better accessible from mobile devices. Great post thanks for sharing this post. I love this line! You are absolutely right. An app isn’t something you can wash your hands of once you push it live; it’s an evolving thing that needs constant care and attention. A bad app can actually hurt the company reputation and a poorly built app can put customer data at risk.